If your countries Amazon is not listed here, you can search by the ASIN, just go to your Amazon and search for 1495220745. August 16th, 2013: fans of Kevin Ayers gathered in Deià to celebrate Kevin’s life and music with his family and friends. In this book Susan Lomas captures the atmosphere of the celebration in words and pictures. The weekend in Deià also sparked a quest to find out more about Kevin by talking to to his friends and visiting other places where he lived. “My aim in writing this short book is to capture a moment in time and to keep the creative spirit of Kevin Ayers in the hearts and minds of music lovers for years to come. 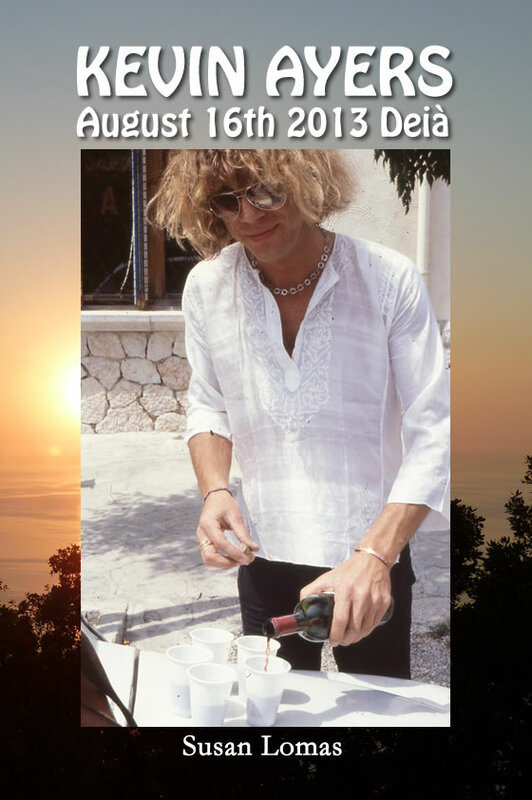 It’s not a biography, but rather a starting point for anybody who wants to know a little more about Kevin Ayers, his music and Deià. I have included descriptions of my visits to Montaulieu and Montolieu too. How can I sum up Kevin Ayers? A career spanning forty-five years, the first Soft Machine album, fifteen solo studio albums, sessions for the BBC, several official live albums and of course many more bootleg recordings. Dozens of singles releases and compilation albums with previously unreleased tracks as extras. If one counts ten songs on each solo album, even allowing for Kevin’s habit of re-working tunes, that’s way more than one hundred original songs in his repertoire. A charismatic live performer with a distinctive voice, which matured beautifully, like a fine red wine. Recording contracts with Harvest, Island and Virgin, to name a few companies. If you simply took the lyrics of Kevin’s songs and published them as a book of poetry it would be an outstanding achievement, full of emotion, wit and wisdom. The fact that these ideas became songs and arrangements which inspired outstanding performances from his musical collaborators needs to be celebrated. Susan’s book is now available as a paperback with beautiful colour photographs and will be available in Kindle format later this week. Just ordered this from Amazon & am really looking forward to receiving it. Thanks for writing it. just received susan’s book; starting to read it now. good luck with the book. the first time I saw kevin was when I went to see soft machine opening up for the jimi hendrix experience on march 9, 1968. It was at stoney brook university , n.y. on long island. I have been a fan ever since (kevin/robert/soft machine). he will be missed. I received the book just before summer holidays and reading it brought a lot of nice memories from those days in Majorca. I just wanted to add a comment to clear up something mentioned on the book. It was me and my wife who actually left those sunflowers on Kevin’s plaque. On the 17th we were visiting Palma and we wanted to return to Deià again in the evening to visit the graveyard. We saw a flower shop when we were almost leaving Palma and, inspired by Galen’s eulogy, we bought two sunflowers for Kevin and Ollie. Thanks for the blog and for the book. Cheers David! Now I know that you read every word in my book. Well done! It’s strange isn’t it, I assumed, because Galen had told the sunflower stories in her eulogy that it was she who had placed them on the grave. Now we can be pretty sure that the flowers we saw and photographed were your ones.